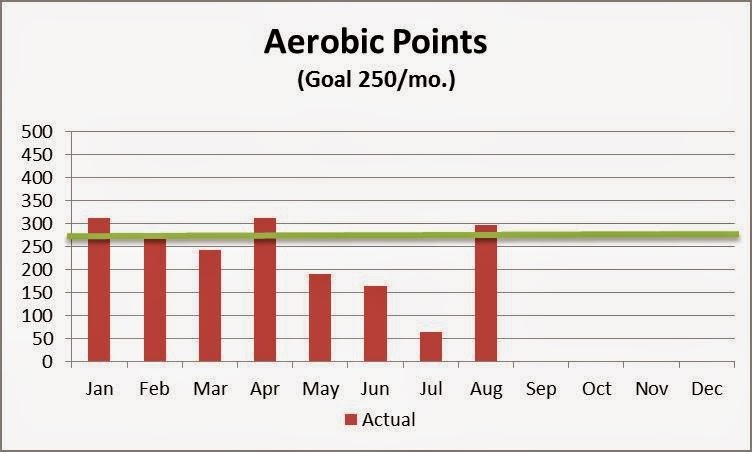 I have periodically posted on Facebook my progress or lack thereof on two of my current goals: Losing 12 pounds and keeping that weight off and exercising sufficiently each month to earn 250 “Cooper Aerobic Points.” Commentary and graphs follow. As of today’s weigh-in, I have lost 9.5 of the 12-pound goal. I’ve discovered two main factors determine the daily variations: (1) salt—eating something salty at dinner or for a later snack retains a ton (well, 1-2 pounds, actually) of water. That’s great if I don’t want to get up in the middle of the night to pee, but I feel bloated the next morning. I can even see the difference in how fat my fingers look (although I can’t scientifically prove that last observation). (2) How full my large intestine is. A couple of days of cheese dishes and Mr. Regular clogs up. Both phenomena are temporary, but evident in the one to two pound weight changes on a daily basis. 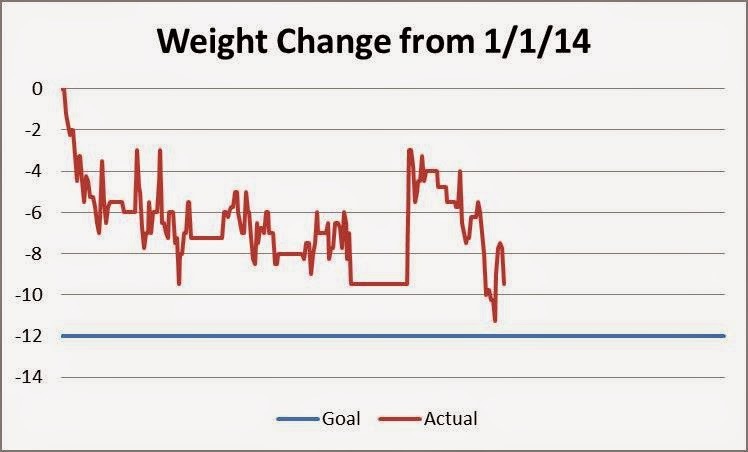 The long flat stretch in the graph illustrates when we were on vacation and I did not have access to a scale. I did, however, have access to too much food, especially desserts, and too little willpower, with the result that I gained five pounds during the month of vacation. I’ve removed that weight again and so as September appears, I am back to where I was in early June. I find it very difficult to exercise when traveling. I know this is also a matter of willpower and better planning. I need to recognize that while in hotels I must use the treadmill (I much prefer being outside) or settle for a short walk outside at a reasonable clip. I can’t run on cement (shin splints) and in many places running on the streets is too dangerous. And, I will have to do that exercising in the early morning before we start our day’s journey. Waiting until after dinner, which often occurs later than normal, is a recipe for diminished will. In August I pulled my left hamstring while jogging, which created an awesome bruise at the back of my thigh. For a change I worked hard at treatment and even with a lost week and a half I was able to still reach the 250-point monthly goal with some to spare. I’ve discovered the usefulness of compression shorts and tights to encourage my muscles to behave themselves. September in the U.P. is generally cooler (good) but wetter (bad) than the summer months. Cooler temperatures makes it more enjoyable to exercise. The rain makes it less attractive, and so I have set my bicycle on the cabin porch to act as an exercise cycle for rainy days. I tried it out once rainy day in August and it worked fine. Everything is in place for success. Now, as the old Nike commercial says, I have to JUST DO IT.